EPAM Systems is focusing on becoming a technology consulting firm through its diverse range of acquisitions. EPAM Systems is a high growth company with more growth expected heading into 2020. The stock has rallied strongly this year, but it's still reasonably priced. EPAM Systems is a software development and technology consulting firm. The company is increasingly becoming more diversified and increasing its operations from software development to include consulting services through its strategic acquisitions. Over the short term, the stock has rallied strongly and may be due for a pullback. Even with its strong rally, the stock is still reasonably priced. I think that EPAM Systems is worth buying for a long-term investment for its future capital gains potential. EPAM Systems has reported financial results for the fourth quarter of 2018 (data from Seeking Alpha and Yahoo). The company's reported revenue increased 26% from the same quarter last fiscal year. EPAM Systems reported a profit with diluted earnings per share of $1.05 compared to a loss $0.59 reported for the same quarter last fiscal year. Its EBIT was up 46% for the quarter. The EBIT (Earnings Before Tax and Interest) gives an indication of the company's profitability at an operational level. On an annual basis, EPAM Systems reported a revenue increase of 27% over the previous fiscal year. The annual diluted earnings per share were $4.24 which was considerably higher than the $1.32 reported for the previous fiscal year. Its annual EBIT was up 42% for the current fiscal year. The return on equity is currently 21%. The return on equity has ranged from 7% to 40% over the last decade with most years above 20%. The profit margin is currently 13%. The profit margin has ranged from 5% to 14% over the last decade with most years above 8%. The company's return on equity is mostly above 20% and its profit margin is mostly above 8%. With these margins, I consider EPAM Systems to be an efficiently run company which is able to extract a decent amount of profits from its revenue and assets base. EPAM Systems' current ratio is 4.6 meaning that its current assets exceed its current liabilities. EPAM Systems' current ratio has ranged from 3.3 to 6.0 over the last decade. The working capital is the company's short-term finances such as cash and short-term deposits that are used for paying its bills. With a current ratio of 4.6, the company has plenty of cash to pay its bills. The asset ratio (total liabilities to total assets) is 22% which means that EPAM Systems' total debt is 22% of the value of everything the company owns (note that the asset value is the book value and not the liquidated value of its assets). EPAM Systems' asset ratio has ranged from 13% to 30% over the last decade. Even with an asset ratio of 30%, the company is conservatively financed and can easily take on more debt if needed. The extra finance will certainly come in handy with any future acquisition plans that management might have. The company's book value is currently $23.35 and with a stock price of $175, EPAM Systems is trading at 7.5x book value. While I consider this to be high, I think it's only an issue with companies that have no earnings growth. The analysts' consensus forecast is for revenue to increase 22% in 2019 and increase another 22% in 2020. Earnings are forecast to increase 14% in 2019 and increase another 22% in 2020. The 2020 PE ratio is 28x and the trailing PE ratio is 41x. On their own, these PEs seem quite high, but in the next two sections, I'll look at the PE relative to its earnings growth to form an opinion on its valuation. The financials overall show that EPAM Systems operates profitably with solid returns on equity and decent profit margins. The company has ample working capital and its total debt is low meaning the company can easily take on more debt if needed. As an investor, I personally like to examine the company's revenue and earnings history. To make this task easier and more convenient, I like to visually present the data on a chart. The above chart visually shows EPAM Systems' historical revenue and earnings trend along with the next two years of consensus forecasts. Examining the chart reveals that EPAM Systems' revenue has increased at a steady rate over the last decade with the analysts expecting this to continue into 2020. The company's earnings have increased over the last decade even though its earnings did drop in 2017. The analysts are expecting the company's earnings growth to continue into 2020. EPAM Systems' is a high growth company with its revenue increasing 26% per year and its earnings increasing 32% per year since 2014. The company's growth is also evident in the size of its workforce. Its employees have increased from around 14,000 in 2014 up to around 30,000 in 2018 (which represents a 21% per year increase). Personally, I like to see the company's workforce increase at a similar rate to its revenue, as this tells me that the company is actually expanding and becoming larger. The reason I look for this expansion is that larger companies are worth more than smaller companies. As a company grows, so does its market cap, which ultimately translates into higher stock prices. Over the years, EPAM Systems has broadened its business services from a purely software development focused company into a more diversified technological consultancy based company. EPAM Systems' strong revenue growth is largely attributed to its acquisition strategy - where the company seeks out businesses operating profitably in a technological field. We're no longer just a software engineering company as the core, but also a strong design and experience consultancy, growing business and innovation consultancy, as well as emerging training and educational firm. Over the last five years, EPAM Systems has acquired 9 technologically based businesses. 1. Netsoft USA acquired in 2014 is a technology services company providing design services. 2. Joint Technology Development acquired in 2014, offers analytics and business process solutions. 3. GGA Software Services acquired in 2014 provides software engineering and management solutions. 4. Great Fridays acquired in 2014 provides product design solutions. 5. Navigation Arts acquired in 2015 provides web development consulting services. 6. Alliance Global Services acquired in 2015 is a software developer for information-intensive businesses. 7. Dextrys acquired in 2016 is a provider of engineering software. 8. Continuum acquired in 2018 is a global innovation design consultancy. 9. Think Ltd. acquired in 2018 is a digital agency working with world-leading brands. The technological fields these acquired businesses operated is ranged from data analytics to web design to design consultancy. One of the acquisitions was a software company operating in the specialized market of data security. I think it's usually better to expand inorganically into new businesses fields. The businesses EPAM Systems has acquired come complete with a skilled workforce who are proficient in their fields. If EPAM Systems attempted to branch into these fields themselves, the company would need to build up a workforce and also build up a reputation. Using the acquisition approach, EPAM Systems purchased not only a skilled workforce but also a business reputation. I think that EPAM Systems increasing its business from only developing software is a good move. While software development is profitable, it's the broader field of technology where the real growth and money lies. We live in a digital world that is only going to become even more technologically advanced and there's a huge variety of businesses looking to take advantage of this. However, in order for these businesses to take advantage, they need the assistance of a technology consulting firm. Now, this is where EPAM Systems is positioning itself with its acquisitions - as a technology consulting firm. As such, EPAM Systems is set to profit from the increased demand for technology-based services and this demand goes way beyond that from software development on its own. Revenue growth for fiscal 2019 will be at least 22% reported. Our 2019 outlook reflects continued strong demand for our services. Management is confident that revenue growth will remain strong and I agree. I think management is on the right track with its business model and I think their approach to capitalizing on the demand for technology will maintain a decent growth rate for the company going forward. EPAM Systems has a history of growth with its earnings increasing 32% per year over the last five years. The forecast earnings growth heading into 2020 is 22%. An appropriate method for valuing growth stocks is the PEG (PE divided by the earnings growth rate). A forward earnings growth rate of 22% gives a forward PEG of 1.2 with a 2020 PE multiple of 28x. It's commonly accepted that a stock is fairly valued when its forward PEG is 1.0 which means that EPAM Systems is slightly overvalued with a stock price of $175. Its fair value would be around $145. The stock chart reveals that EPAM Systems' stock price has reached a new high. The stock after peaking in 2018 pulled back along with the stock market. After bottoming late in 2018, the stock rallied strongly this year as the stock market resumed its rally. In the short term, the stock appears to be overbought and is due for a pullback. The stock rallied without any pullbacks from $115 at the start of the year up to the current $175. This is a 48% gain in only three months or an annual gain of 190%. Such high gains are not normally sustainable without pullbacks. These pullbacks only need to be minor and are needed to maintain an uptrend. It's always possible that EPAM Systems continues trading higher with the current rally, but sooner or later, the stock will pull back. From 2017 to the 2018 peak, the stock gained 120% with an uptrend that contained numerous small rallies and small pullbacks. If the stock market continues to rally over the next two years, EPAM Systems could reach $250 (based on adding the 2017-2018 gain of 120% to the $115 at the start of this year). EPAM Systems has a history of earnings growth and this growth is expected to continue. Over the longer term, EPAM Systems has the potential to continue higher and will probably do so as long as its earnings continue to increase. EPAM Systems has been on an acquisition spree over the last five years acquiring technological based businesses. Management is changing the company's business model from a pure software development firm into a broader technological consulting firm. EPAM Systems is financially in good shape and operates with strong returns on equity and decent profit margins. The company has ample working capital and carries little debt on its balance sheet. I think that management's focus on turning the company into a technological consulting firm will drive future growth. 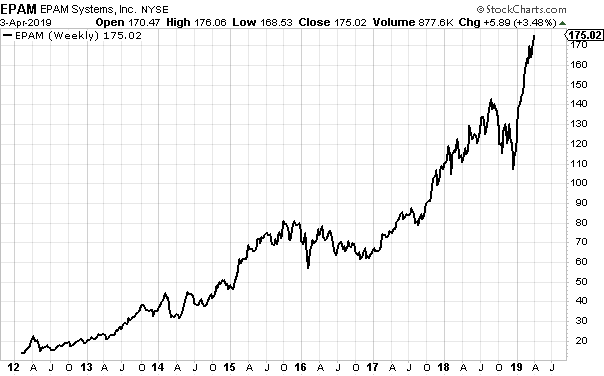 Even though the stock has rallied strongly this year, it's still reasonably priced. I think that even at current prices, EPAM Systems would make a good long-term investment. However, investors would need to be patient as the stock may pull back in the short term, but over the longer term, I would expect its uptrend to continue.